How to Maintain Your Artificial Lawn | Turf Etc. Artificial lawns in Kansas City are easy to maintain. You want to take pride and keep up with your artificial lawn so it can last for years! Not only will your artificial lawn last for years, but it will look more beautiful than ever. Lucky for you, rainfall is the best cleanser for artificial grass. However, in areas scarce of rainfall, an occasional spray from the hose will do just as well to keeping your turf clean. This will help prevent any dust, pollen, or airborne pollutants from staying your artificial lawn. It is important to clean up spills quickly rather than waiting. It’s always easier to clean up a fresh spill than one that has dried or hardened. Synthetic fibers have strong resistance to staining, but it is important to realize that they are part of a system with various components designed for overall performance. Some cleaning agents that would otherwise be safe to use on the top layer or grass fibers can still be harmful to the backing or other components of the turf system. That is why we have grouped cleaning agents into ones that can be used directly on the turf surface and the second which should only be applied by a rubbing cloth to minimize the penetration of harmful agents below the surface! We recommend a periodic brush here and there to help keep the aesthetic appearance of your beautiful lawn. Don’t forget those corners! You want to make sure your entire lawn is “fluffed up” in all areas to give it a strong appearance. We recommend using a brush with synthetic bristles rather than a brush with metal or wire bristles, as these will change the turf fibers. Taking a few minutes to brush your yard is still way easier than having to use a lawn mower every couple of days! Even though your SYNLawn brand turf is tough and has durable fibers, you should still take precautions to prevent any damage to the turf. After all, you take pride in your lawn that looks beautiful year-round, right? Although fireworks are fun, keep them away from your turf. Similarly, avoid using cigarettes or using open flames near your turf, as these can cause heavy damage to the grass fibers. Don’t let your lawn turn into a parking lot, keep cars off of it to ensure that there will be no tire marks or indents to from a vehicle. Finally, you will want to cap off or remove any nearby sprinkler systems. This is because water from sprinkler systems can leave mineral deposits on the turf that will cause it to lose that vibrant green color. Don’t Be Afraid to Call Us! 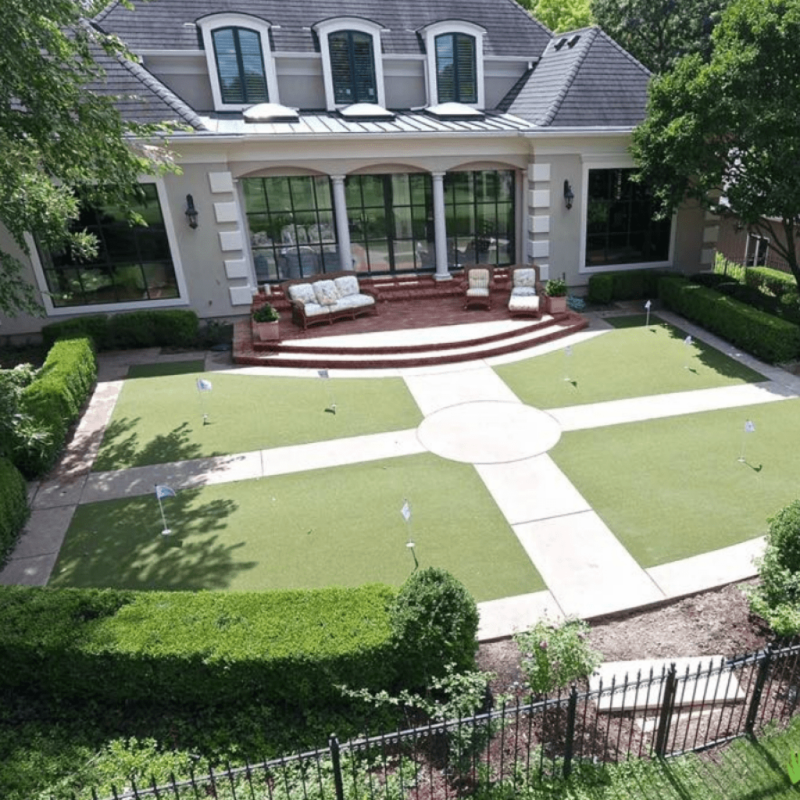 SYNLawn Kansas City does offer a cleaning service for your artificial grass. We will come to you and ensure your lawn looks just as beautiful as the day it was installed. Our synthetic turf cleaning services can renew and revitalize the life of your artificial turf in a timely fashion. You don’t want those minor problems to become a major problem just because you didn’t reach out. We are glad to come out to assist in caring for your artificial lawn in any way we can. At the end of the day, you want your synthetic lawn to look its very best and last as long as possible. Nobody does artificial grass quite like SYNLawn, and our turf cleaning steps and services promise to carry on that tradition. Contact us today for any questions you may have about maintaining your artificial lawn.